Today was quite an interesting day. We’d planned to take the boys for a bike ride in Richmond, for a nice morning out. On our way there, though, we thought that it would be nice to keep heading west up to Bilpin. Before we got to Bilpin, however, we realised that we were a bit late in the season for picking apples. 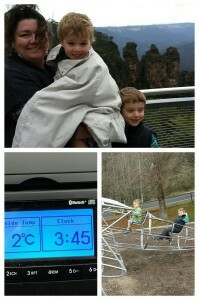 Since we were on the road, we thought we would head to Echo Point in the Blue Mountains. After stopping to buy a few apples from The Fruit Bowl at Bilpin, we had lunch in a park in Blackheath. While we were there the weather took a turn for the worse, with the clouds coming in and the wind picking up a bit. It was a quick stop at Echo Point, just long enough for a few photos. Then it was off for some hot chips before heading home. As we left Katoomba it was 2 degrees at 3:45pm, which made for an interesting display on the car’s dashboard. It wasn’t the day we’d planned, but we all enjoyed it.